Canines at Northwest Trek: gray wolves, red fox. Take a walk on the wild side to find our canids, or canines. Get up close and personal with our gray wolves from inside the E.H. Baker Cabin. Spot a red fox, master of camouflage. You might even catch a howl or two. WHAT: Despite the name, the gray wolf’s coat can range from almost pure white to black. WHERE: Forest and tundra, wilderness in Northern U.S. and Alaska, Europe and Asia. SIZE: Length 4.5-6.5 ft.; height 32-34 in. ; weight 75-110 lbs. EATS: Large and small mammals. BABIES: Breeding from January-April. After a 2-month pregnancy, the female gives birth to a litter of 2-11 pups weighing about 1 pound. FUN FACTS: Wolves live and hunt in a pack that is structured socially in class layers, with an alpha male and female at the top. The alpha female is the only one to give birth. 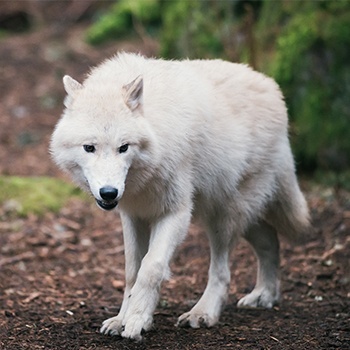 Wolves communicate visually in sophisticated ways, using body posture, facial expressions and tail positions. Audible communication is the howl, which bonds the pack, helps them reassemble and is sometimes just for play. WHAT: Red foxes look like a small dog, with a reddish-yellow coat, bushy white-tipped tails. They can also be black, silver or a red-silver cross. WHERE: Forest and open country throughout northern hemisphere. SIZE: Length 22-25 in. ; height 13-35 in. ; weight 10-15 lbs. EATS: Insects to small mammals, also berries and other plants. BABIES: After a 63-day pregnancy the female gives birth to pups in March or April. FUN FACTS: Foxes usually hunt alone for small prey. 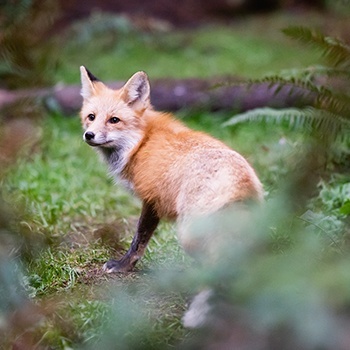 Like other canids, foxes communicate through sounds as well as scent-markings. Their vocalizations range from aggressive yapping and howls (young males) to soft whimpers and barks (vixens and pups). Pups are usually born in burrows or rock dens, and remain there for about a month after they are born. When a keeper and a horticulturalist talk, they come up with great ideas - like trees as wolf enrichment.